Hamed Kane is from Senegal in West Africa and is a Baye Fall, a disciple of Cheikh Ibra Fall, the faithful companion to Ahmadu Bamba, visionary founder and prophet of the Mouride in Touba. As well as being a recognised master of the khin drums, with their many voices and intricate language, Hamed has learned much of their history and also their construction. 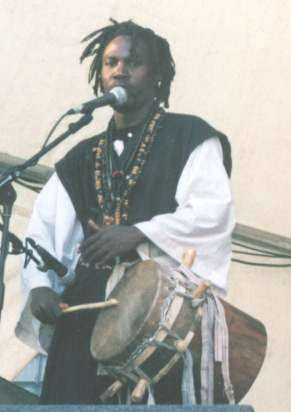 Music is central to the activity of the Baye Fall community, where the Sufi chants are accompanied by unique percussive rhythms. A leading exponent of the tradition, Hamed has taken this forward in the album "Akassa" with his own distinctive melodic style, and lyrics in the Senegalese Wolof language. Hamed performed at the Edinburgh International Festival (1998) and the Sacred Voices Millenium Music Village (London, 2000). Media appearances include Cable TV & the BBC World Service.